Introduced at the International Workboat Show is ACR Electronics (a Drew Marine Company) GlobalFIX™ V4 Emergency Position Indicating Radio Beacon (EPIRB). This new professional grade design EPIRB offers the latest in marine electronic lifesaving technology and features high-efficiency electronics for reliable performance which owners and operators in the commercial shipping and offshore industries can trust to ensure the safety of their crew. Offering new features and three levels of integrated signal technology, the ACR EPIRB received a National Marine Electronics Association (NMEA) Product of Excellence Award in 2016. 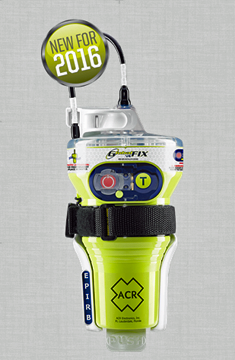 ACR Electronics' GlobalFIX™ V4 EPIRB. The robust internal 66-channel GPS provides faster acquisition from a cold start, accurately fixing the position of the vessel in distress to within 100 meters of its location and relaying it to rescue personnel in as little as three minutes. The coordinates are transmitted via a 406 MHz distress signal to search and rescue authorities, with a 121.5 MHz homing signal further assisting in concluding the final stages of a rescue. An integrated energy-efficient four LED array strobe light guides rescuers to the beacon’s exact position. Manual activation of the EPIRB is simple and there is a protective keypad cover to help prevent false alarms. It also has a new wrist strap for hands-free carrying in an emergency evacuation. The full-featured ACR device has an all-new, user-replaceable battery pack, which has a 10-year replacement interval that reduces the overall ownership cost. The Class 2 lithium battery exceeds the required 48-hour operating life. The conformal coated circuit board further protects electronic components from the harsh marine environment. The GlobalFIX V4 has two functional self-tests to monitor the beacon’s transmission, power and battery performance and GPS acquisition. The new EPIRB is available in two different brackets, a manual release Category 2 bracket or Category 1 hydrostatic bracket. The Category 1 bracket releases and ejects the EPIRB from the bracket to float free to the water’s surface. The water sensors will automatically activate the EPIRB and it then begins transmitting the distress message. The GlobalFIX V4 is also compact enough to be stored in an ACR RapidDitch abandon ship bag along with other safety gear.